Every new Mercedes-Benz AMG high-performance vehicle offers an outstanding mix of “more power from less fuel” and the G 63 AMG is no exception. Its range has been further enhanced with the state-of-the-art power train of the new ML 63 AMG. 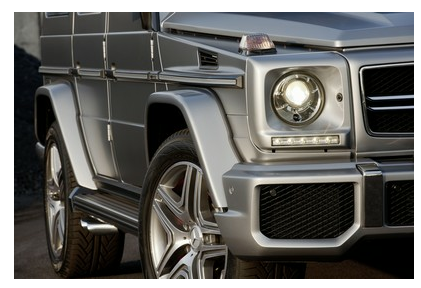 This enables the new G 63 AMG to accelerate from zero to 62 mph in just 5.4 seconds, with a new top speed of 130 mph. The fuel consumption of 20.4 mpg is a 2.7 mpg improvement on the predecessor model, representing fuel savings of 13 per cent. The seven-speed automatic gearbox features three drive modes and an automatic double-declutching function for downshifting. As standard, the G 63 AMG runs on new AMG 5×2 spoke 9.5 x 20 titanium-grey painted light alloy wheels that have a high-sheen finish and are fitted with 275/50 R 20 tyres. The vehicle can also be fitted with matt-black-painted AMG light alloy wheels with high-sheen rim flanges. All-round ventilated and perforated brake discs at the front and rear provide optimum thermal capability and outstanding deceleration values. The new generation of the G-Class also offers a luxury off-roader with a completely readjusted ESP® (electronic stability control – a computer device used to improve traction) and in an emergency stop situation, the G-Class has a special maximum effect braking system. The ESP® trailer stabilization feature provides increased safety when a trailer is in tow. Another completely new feature is the AMG bumper, with three generously dimensioned openings as airflow inlets for the cooling module. Vertical high-gloss chrome stainless steel inserts create a distinctively masculine look for the G 63 AMG, with new LED daytime running lamps fitted below the bi-xenon headlamps. UK pricing, leasing and specification are still to be confirmed for the G 63 AMG, which is due to arrive in autumn 2012. If you’re looking to lease a new Mercedes contact our sales team. Alternatively, visit our website where you will find new and used Mercedes available for sale or on finance.